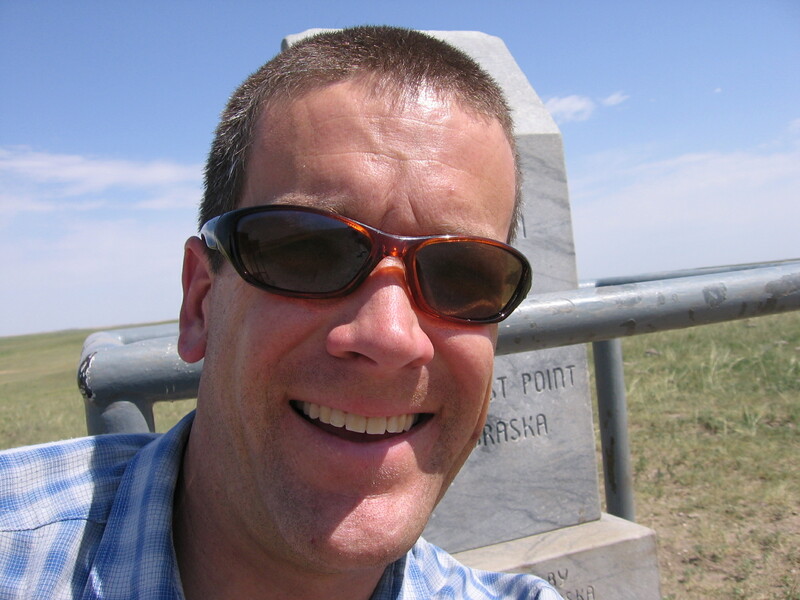 Continuing our look at state high points of the Great Plains, we come now to Panorama Point in western Nebraska (elev. 5,429 feet). Admittedly, Panorama Point does not quite have the prominence of many other state high points which are distinct landforms and rise substantially from surrounding plains or valleys. Panorama Point belongs to a class of state high points that do not dominate the surroundings in any way, and would altogether go unnoticed were it not for the arbitrary lines we have drawn on the globe to satisfy our need for boundaries and borders. Nonetheless, it does do a pretty good job of living up to its name in that there is a sweeping view in all directions from the “summit,” which is no more than a slight rise on an otherwise fairly typical ranch setting. This high point is on private property, but is well-marked along the edge of a bison ranch. The owner requires a $3 entrance fee, which can be placed in a receptacle at the gate. When the routing for the Great Plains Trail is complete, the trail will include the road that connects to Panorama Point. All told, the GPT will include at least three state high points (TX, SD, and NE), and possibly as many as four or five (KS, ND). Happy Highpointing! This entry was posted in Uncategorized and tagged panorama point, state high points. Bookmark the permalink.